Up to 40,000 Norwegians have staged an emotionally charged singalong in Oslo near the court building where Anders Behring Breivik is on trial for the murder of 77 people in a protest organisers said showed he had not broken their tolerant society. “It’s we who win,” said guitar-strumming folk singer Lillebjørn Nilsen as he led the mass singalong and watched the crowd sway gently in the rain. Many held roses above their heads, and some wept. The protest followed several days of defiant testimony from Breivik, who has admitted killing his victims but denied criminal guilt. The crowd chose to sing Children of the Rainbow, a song that extols the type of multicultural society Breivik has said he despises and one he dismissed during the trial as Marxist propaganda. People then marched to the district courthouse where Breivik was on trial, close to the site where he set off a bomb that killed eight people on 22 July last year. 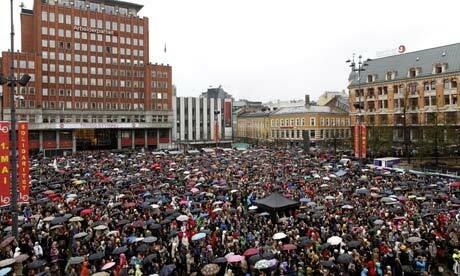 Thousands more Norwegians held similar musical protests in towns across the country. The protest came as survivors lined up inside the courtroom to take the witness stand and describe the bombing. ….. This entry was posted in Visions and tagged Courage, Social Change, Vision by Margo. Bookmark the permalink.